As discussed in previous articles and videos, pressure is the amount of force acting on a specific area and is equal to the force divided by the area. 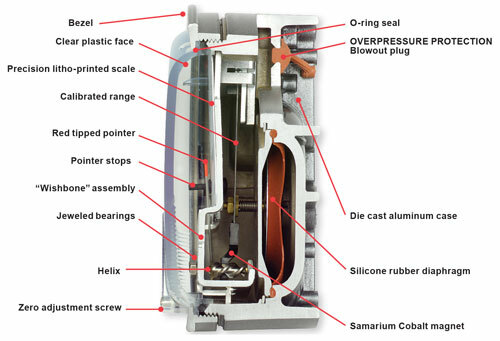 There are several types of sensing elements used inside pressure measurement devices. By understanding the components that make these products function and carefully comparing their specifications with your application requirements, you ensure the correct instrumentation is being used for your application. Today we’ll be discussing the functions of diaphragms and Bourdon tubes. 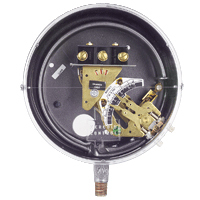 A diaphragm is a common sensing element, found within the Dwyer Magnehelic® Differential Pressure Gage, Series 2000. Rubber silicone diaphragms, used in the Magnehelic® gage, appear much like a slice of a deflated balloon. Care must be taken in order to prevent over-pressurizing the gage, as this runs the risk of stretching the diaphragm out of its normal shape and altering overall gage calibration (or even tearing the diaphragm). In some cases, simply rotating the diaphragm out of its normal, vertical mounting position can cause the diaphragm to deflect due to the force of gravity, changing the gage’s zero reference. When used in systems within published specifications, however, a sensitive diaphragm allows for very precise pressure indication. 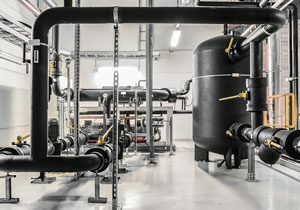 Without the use of an inline diaphragm seal or barrier, process media typically comes in direct contact with the diaphragm. In some applications, this process media may not be suitable to diaphragms of certain material. For many products Dwyer offers, a diaphragm material can be specified to suit an end user’s needs. For example, several Dwyer products such as the Magnehelic® gage, Photohelic® gage, and Capsuhelic® gage can be created with Buna-N diaphragms by ordering with option -BUNA. This is beneficial for applications using media such as propane, natural gas, or any media which is known to react adversely with the silicone rubber that makes up the standard option diaphragm. 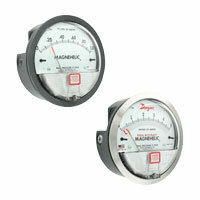 Choosing the appropriate diaphragm material for each application will allow your gage to handle its job appropriately. 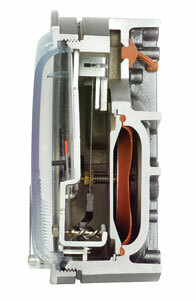 The diaphragm within the Magnehelic® gage works with the key magnet and helix assembly unique to its design. Deflection of the diaphragm pushes a spring-loaded magnet, which in turn rotates a helix that pivots the indicating pointer. Not all pressure-sensing devices utilize diaphragms, however. Another type of sensing element is a Bourdon tube. A Bourdon tube—often made of metal—appears as a curved or curled tube capped at one end. When media is forced through this tube, the resulting pressure causes the tube to straighten. 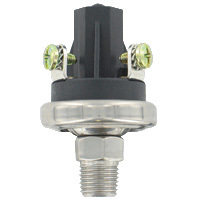 Bourdon Tube Pressure Switches, Series DA/DS, utilize this type of sensor to detect pressure. As pressure propagates through the Bourdon tube within the Series DA/DS, the tube uncurls, pivoting a mechanical linkage and activating a switch at a point which is set by an end user. In some configurations with relatively low switch set-point options, simply pulling the Bourdon tube slowly towards the outside rim of the device casing will simulate pressure buildup within the tube and cause the switch to trip. As is the case with many diaphragm sensors, media comes in direct contact with a Bourdon tube. It is therefore important to ensure that the Bourdon tube material is suitable for whatever process media is in use. Fortunately, the Series DA/DS are available in durable materials such as: 316 stainless steel, 403 stainless steel, and brass. These materials allow for use in applications with relatively high pressures and temperatures. Diaphragms and Bourdon tubes both have unique benefits and limitations, and in some cases one will be better for a specific application than the other. A device with a diaphragm may be better-suited than a device with a Bourdon tube when monitoring pressure within a patient’s room in a hospital, for example. 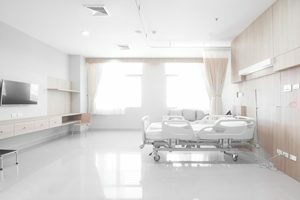 Most patient rooms are kept at slightly lower pressures than the surrounding hallways and labs; this allows clean airflow to travel naturally into a patient room while simultaneously suppressing contagious air from exiting. Oftentimes, the difference in pressure between the rooms is relatively small—around 1-5 inches of water column. The devices in place to monitor this pressure are typically permanently mounted in limited-access areas, so as to not be easily tampered with. Due to the need to monitor relatively-low pressure with fine accuracy, implementing diaphragm devices such as the Digihelic® Differential Pressure Controller, Model DH3-006, where they will not be jostled around ensures readings with accuracy +/-1% full-scale. In other cases, such as when monitoring and controlling relatively-high water pump pressure, Bourdon tube devices like the Series DA/DS can have incredible pressure range capabilities and will be well-suited to handle pressures beyond 1000 PSI. In other lower-pressure pump applications, like monitoring and controlling pressure in a fuel tank, system pressures around 100 PSI are achievable with the Durable Pressure Switch, Series A6, which incorporates a diaphragm of polyamide film. Understanding how pressure sensing elements work is crucial for choosing the best instrumentation for your application. For information about pressure and how it is referenced, please watch the informational video on our website. Previous PostPrevious Ask the Expert: What is the difference between a glycerin-filled pressure gage, and the dry version? Next PostNext Ask the Expert: When should I choose a solid state relay over an electromechanical relay?